Home > Mutual Funds - Alerts > ICICI Bank as most popular stock for Mutual Fund Companies..
ICICI Bank as most popular stock for Mutual Fund Companies..
ICICI Bank, the second-largest private lender, is now the most-chased stock by equity mutual fund (MF) schemes, surpassing bigger rival HDFC Bank. 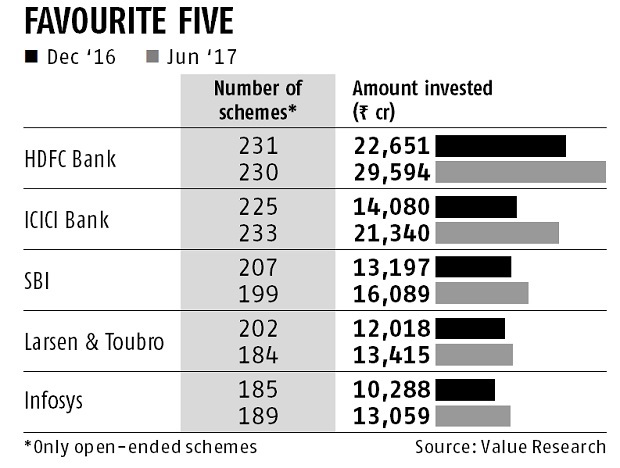 At the end of 2017 June, 233 open-ended equity schemes had invested in ICICI Bank, while 230 had exposure to stocks of HDFC Bank. In value terms, however, HDFC Bank continues to lead with Rs 29,594 crore. ICICI is the only counter apart from HDFC Bank which enjoys investments worth over Rs 20,000 crore by equity fund managers. So far in 2017, shares of HDFC Bank gained 48%, while those of ICICI Bank have added 18%. Fund managers see ICICI Bank as an attractive proposition going forward, given is relative under-valuation and strong promise of its insurance and mutual fund subsidiaries. After the listing of its insurance arm ICICI Prudential Life Insurance, the stock has seen renewed interest, with fund managers lapping up shares. MF investments in the counter has risen from Rs. 14,080 crore in December to Rs. 21,340 crore in June, an increase of 51%. During the same period, investment value in HDFC Bank has grown only 30%, despite a sharp rally in the counter. Industry players say the growth in assets in ICICI Bank is on account of a sharp rise in incremental flows into the counter. Some equity schemes, managed by marquee fund managers investing higher allocation in ICICI Bank, include HDFC Equity Fund, HDFC Top 200, ICICI Prudential Focused Bluechip Equity, Birla Sun Life Frontline Equity & Franklin India High Growth Companies Fund, among others.